The Kibale Chimpanzee Project is dedicated to the long-term study and conservation of wild chimpanzees. We strive to maintain the integrity of Kibale National Park, and to protect the many endangered eastern chimpanzee communities and other animal populations that call it home. Consequently, in 1997, the Kibale Chimpanzee Project, in collaboration with the Uganda Wildlife Authority, established the Kibale Snare Removal Program (KSRP) to reduce illegal activity, especially snaring, in the park. KSRP has three major goals: 1) forest preservation and wildlife protection by reducing illegal activity in Kibale, 2) community involvement, and 3) educational outreach. To work towards these goals, KSRP currently employs a Ugandan team of five Patrol Rangers, a Community Liaison, and a Conservation Education Coordinator. 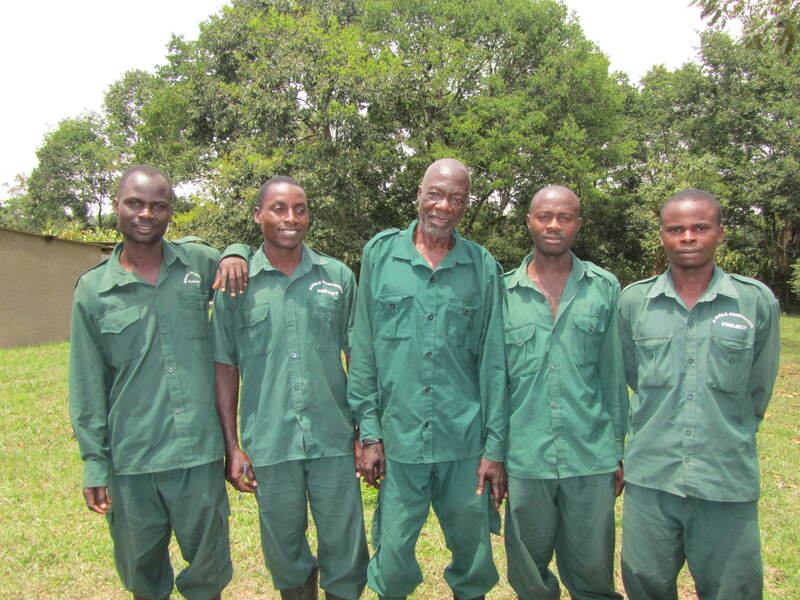 Kibale Snare Removal Team Rangers Charles, Paul, Okwilo, John, and Godi (from left to right). Snares removed in KNP by KSRP rangers from Jan-Jul 2012. 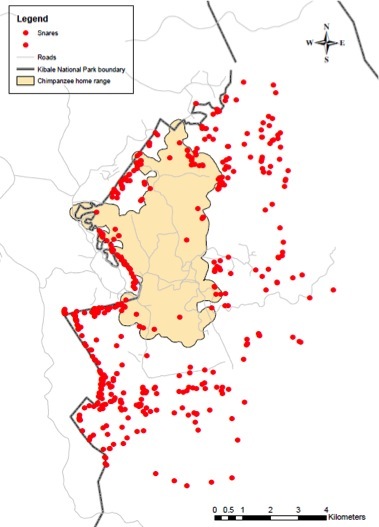 Most snares are concentrated along the park boundary and outside of the Kanyawara chimpanzees’ home range (shaded area). Wildlife Protection/Preservation. Our Rangers spend 26 days per month patrolling two-thirds of Kibale National Park in search of snares or signs of other illegal activities. Not only do the rangers find and remove hundreds of snares per year, they also identify the areas where hunting and other illegal activities occur within the national park via rigorous data collection protocols. While these efforts were initially established to help reduce the number of chimpanzee snare-related injuries, active snare removal benefits all wildlife living in the national park. Over the past decade, snaring and other illegal activity within the Kanyawara chimpanzees’ home range has drastically reduced, owing to our high patrol effort and the prevalence of researchers, field assistants, and the Uganda Wildlife Authority. However, outside of this area, illegal activity is still problematic, and we are constantly working to reduce these threats to the wildlife and the forest. While new chimpanzee snare injuries still occur, the location of those injuries are mainly confined to chimpanzees who range in the peripheral areas of their territory, or who immigrate to Kanyawara from other parts of the forest. 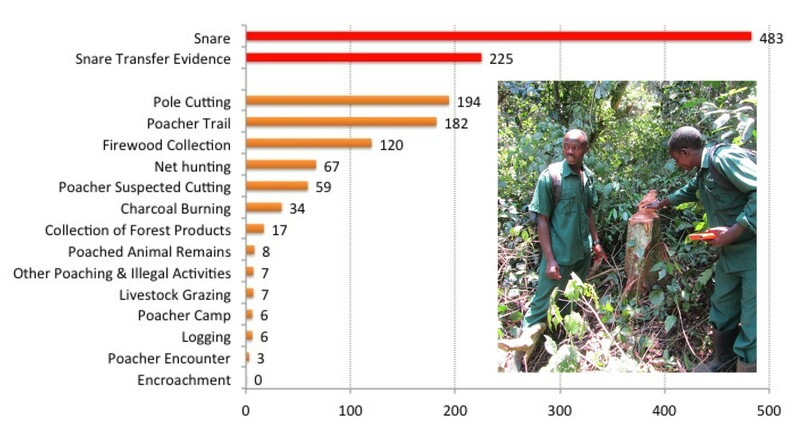 Illegal activity documented in KNP in 2013 by KSRP. 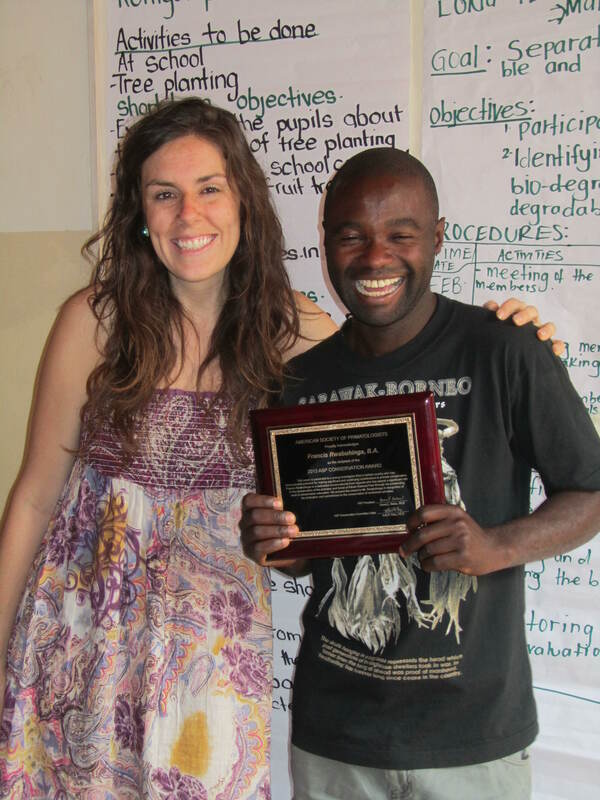 Jessica Hartel, KSRP Director, presenting Francis Rwabuhinga, KSRP Conservation Education Coordinator, with the American Society of Primatologists’ 2013 Conservation Education Award. Community Involvement. While the snare patrol team attempts to improve the immediate condition of the national park, and the safety of its inhabitants, we are simultaneously working to address these problems in future generations through our conservation education and community outreach programs. Our Community Liaison is a constant presence in the local villages, talking to people about human-wildlife conflict (which often involves elephants, baboons, and chimpanzees), and collecting data on aggressive interactions between humans and wildlife, crop raiding, and sightings of problem animals outside the forest. We use these data to better understand how local people living near the forest can co-exist with wildlife in healthy, non-aggressive ways. KSRP senior ranger, Paul Mugisha, talking about snaring in the national park with a Wildlife Club at a local Kasiisi Project school. Educational Outreach. Our Conservation Education Coordinator works collaboratively with local schools (see The Kasiisi Project) and communities to promote conservation education activities and to encourage alternatives to illegal hunting. Our rangers give talks to local school Wildlife Clubs on the problem of snaring in the national park, the negative impacts of human disturbance, and the effects of these issues on local chimpanzee populations and other wildlife. We also jointly sponsor an annual conservation-oriented Debate Cup with the Kasiisi Project, which encourages students to think critically about conservation issues that are relevant to their lives through active debate. Long-term funding for our conservation program is currently provided by Jane Goodall Institute-Austria, Jane Goodall Institute-Netherlands, and Jane Goodall Institute-Switzerland. 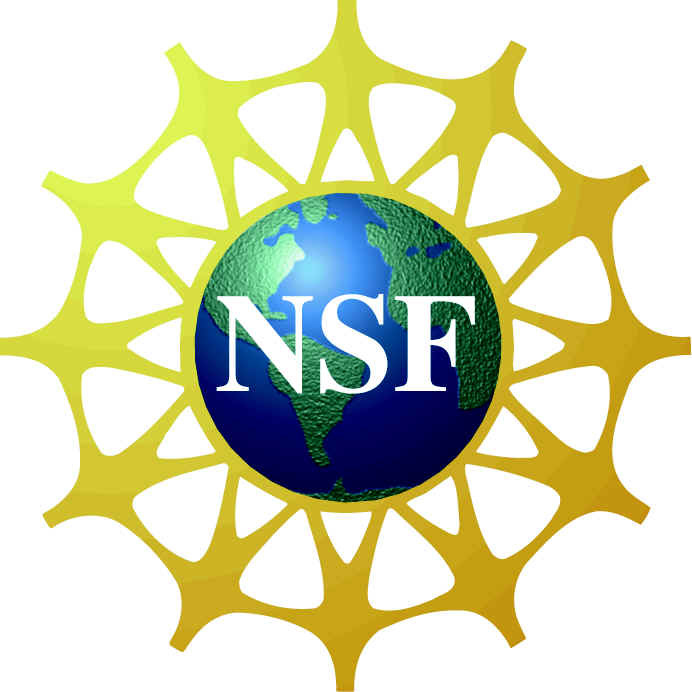 KSRP also works collaboratively with the Uganda Wildlife Authority, The Ngogo Chimpanzee Project, The Kasiisi Project, Jane Goodall Institute-Uganda, and Jane Goodall Institute-USA.